Recent year have seen the rise of the smart beta ETFs. Different from traditional type ofETFs which passively track indexes by simply constructing funds based market capitalizatismall PowerShare FTSE RAFI US 1000 ( PRF ) apply fundamental weighted strategy to track FTSE RAFI US 1000 index. Its fundamental weighted strategy select stocks among FTSE RAFI US 1000 indexed stocks based on four fundamental factors: book value, cash flow, sales and dividends. As is shown in Figure 1, the PRF overlap with its benchmark index in the first half the the sample period but underperform its benchmark index. 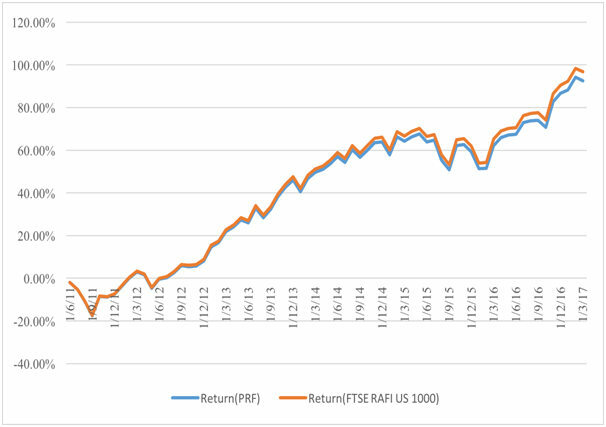 Thus, the PowerShare FTSE RAFI US 1000 are not delivering on the objective to deliver higher risk adjusted return. PowerShare Russell 2000 pure value (PXSV) employ value strategy and tract Russell 2000 pure value TR USD index. Figure 2 shows that Cumulative return on PXSV outperform its benchmark index over the sample period. Thus deliver its aim with higher return compare to its benchmark. Similarly, Figure 3 shows that PowerShare S&P 500 High Beta (SPHB), PowerShare S&P 500 Growth(SPYQ), Vanguard Russell 2000 Growth are not deliver their objectives as they almost always underperform their benchmark. PowerShare S&P 500 Quality(SPHQ) sometimes outperform and sometimes underperform its benchmark. But overall, if one buys the SPHQ over the sample period, s/he earn higher return than its benchmark. To provide a more direct view of the performance, I calculate 5 performance measures to evaluate the performance of the 6 Smart Beta ETFs. Combining performance measures with above figure analysis, I can generate investment advice for investor in terms of which ETFs is worthy investing. For ETFs those outperform their benchmark(PXSV and SPHQ), they also have higher geometric average monthly return than those ETFs which underperform their benchmark. Especially, SPHQ has the highest geometric average monthly return, sharp ratio, and lowest CAPM beta. It means that SPHQ earn highest market adjusted return and bear less market related risk. In addition, Only the CAPM alpha of SPHQ is positive and significant. Finally, the SPHQ has the lowest correlation with its benchmark. It can be regarded as a sacrifice to earn better risk adjusted return. Overall, above measures consistently show that SPHQ earns better risk adjusted return. Thus, I will most likely to recommend the SPHQ to prospective investor.